There are two different sized houndstooth patterns in the Heirloom Patterns set. I used the smaller one here. 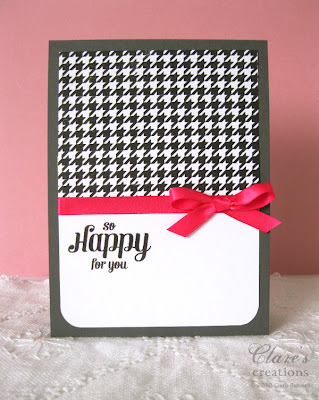 I was SO delighted when I saw this set, I've been longing for a houndstooth stamp! Anya did a fabulous job of designing this set! It's so easy to line up and stamps wonderfully. 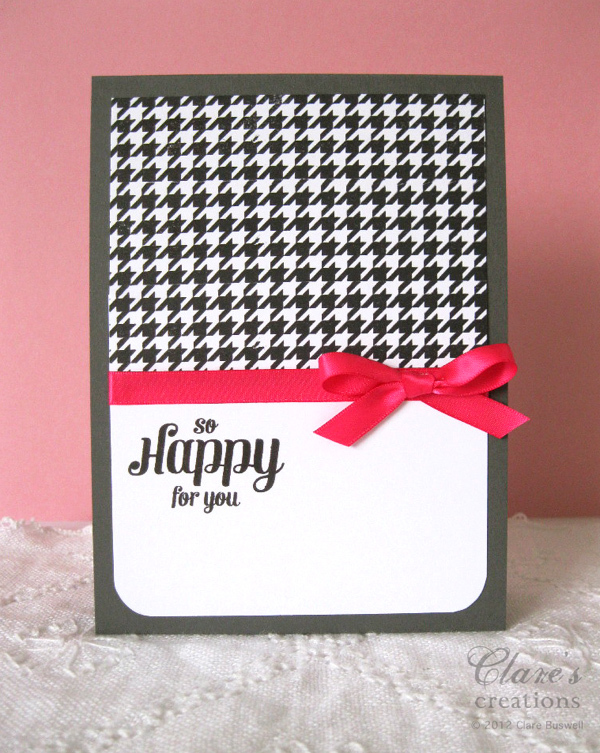 I guess you'll be seeing lots more houndstooth cards from me! : ) The bright pink satin ribbon is from the Craft Fairy. I decided to go with a charcoal cardstock for the card base instead of black, for a softer look. The sentiment is from Compact Sentiments, another must have set! 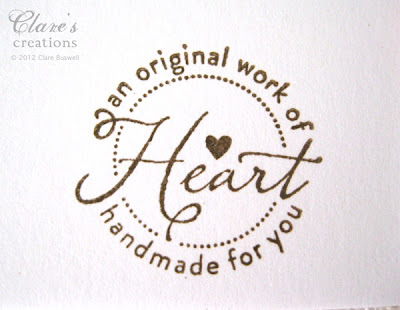 I love the font Claire used on this and I really love the wording in the sentiments. 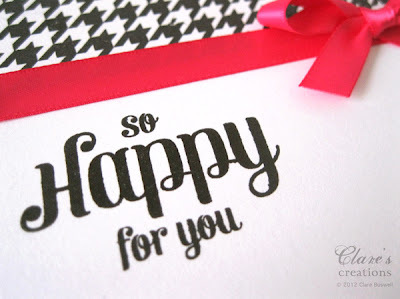 I never have enough sentiment stamps, there's always one you're looking for that will work with the card you're making. For my second card I went with a more shabby, distressed and textural style. I used the diamond patterned background stamp on this one from the Heirloom Patterns set. I stamped the diamond pattern onto some beige card and embossed in white. Then I inked over it with some Distress Inks in Antique Linen and Vintage Photo. On the little tag I lightly stamped another of the patterns from Heirloom Patterns using Memento Angel pink. The fabulous sentiment is from Compact Sentiments. Delighted to have a new baby sentiment!! For the flower I made a rosette using the larger Sizzix rosette die and inked the top. For the leaves I just drew a simple leaf template and cut from felt (2 layers) and stitched on the machine. Stapled together because it was handy! 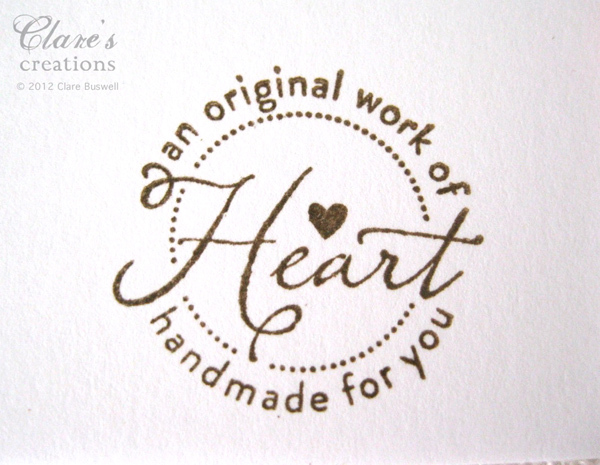 Oh and here's another of those fabby signature stamps from Make Your Mark, I added this one to the back of my card using coffee archival ink. Check out what the rest of the WMS DT have created! Here's the ladies sharing previews today. Gorgeous Clare, love this graphic pattern and the pop of pink! I love the dog collar and the card! I want that houndstooth image too. This card is wonderful and so cheerful. Great job!!! 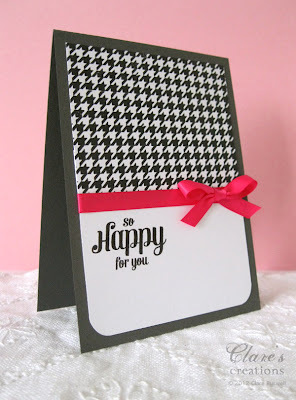 Great stamping on your rounded corner panel Clare - the splash of pink in the ribbon really sets off the black houndstooth! What a fun pic you found for inspiration! So stylish and beautiful! Absolutely WONDERFUL! Inspired by a dog collar, heeee! 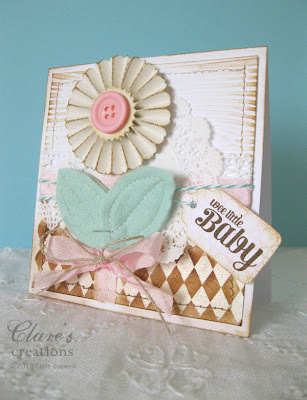 You showed us that inspiration is everywhere, Clare :) Your stamping is PERFECT! I just love houndstooth in black and white, and it's set off perfectly with your hot pink bow!! Cerise pink - one of my favourite colours - love what you created. Wonderful and I really like what you have made. The dog collar is a great idea. Thanks for sharing! Wow Clare the first card is so striking with the pop of pink. The second card is so soft and beautiful - Love it all!! How pretty both cards are. Love the houndstooth pattern. Such pretty and classy projects Claire. So different but both absolutely fabulous. I love the graphic simplicity of the first card, especially with the pop of pink! And the shabby chic card is super too! Love these sets. Love them both, can't wait till I can get some of those new stamps, love the sentiment on the baby card. TFS Clare! Super sweet projects Clare! Love the white embossed diamond pattern! Pure yumminess Clare!! I adore the clean, classy lines of your first card with the houdstooth!! 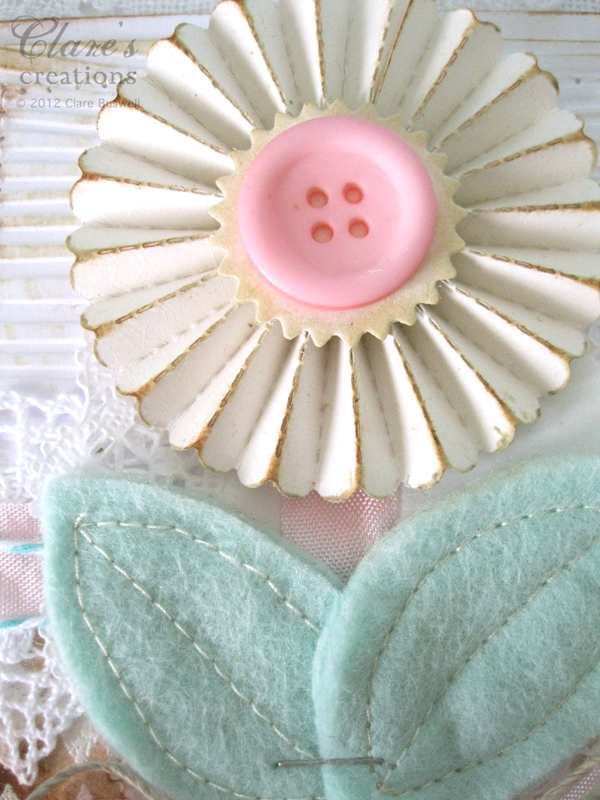 And your shabby card with the rosette flower and sewn leaves...*sigh*...two super fabulous creations!! 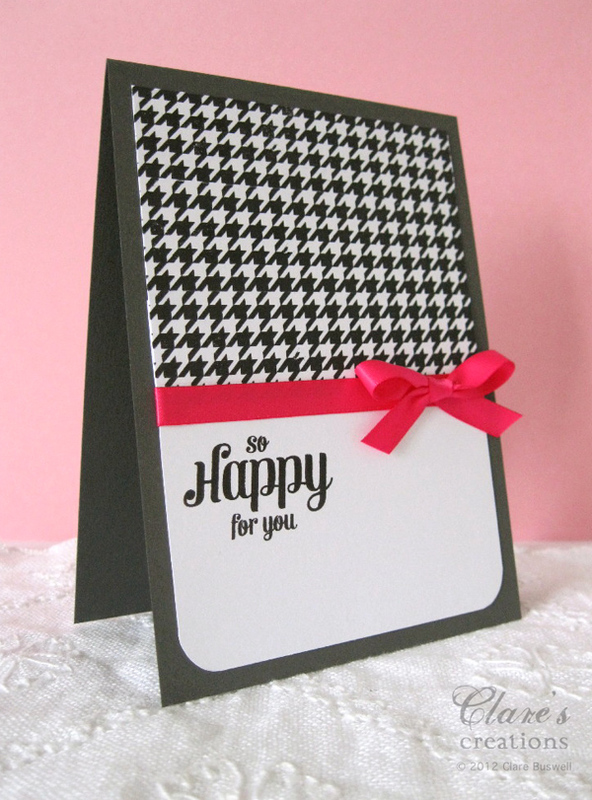 I love the graphic design on your first card with the houndstooth, you got it lined up so perfectly! 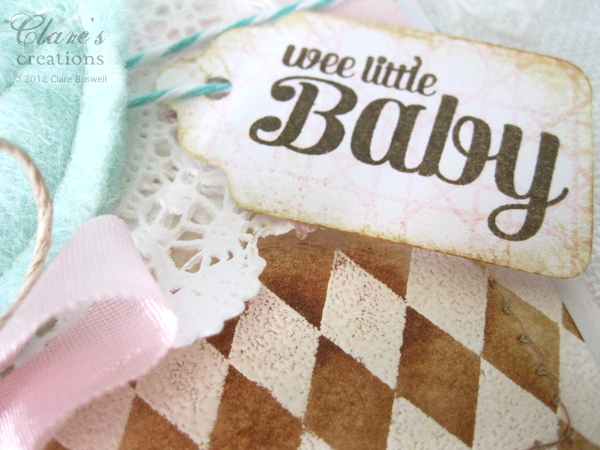 The wee baby card is just the sweetest thing, with a darling sentiment. Beautiful cards! Is it the gorgeous color of the ribbon that balances the houndstooth card so well, or the wide expanse of white, or (what)? And the baby card could be studied for some time and still see some detail not seen before. Lovely. Both are gorgeous cards! 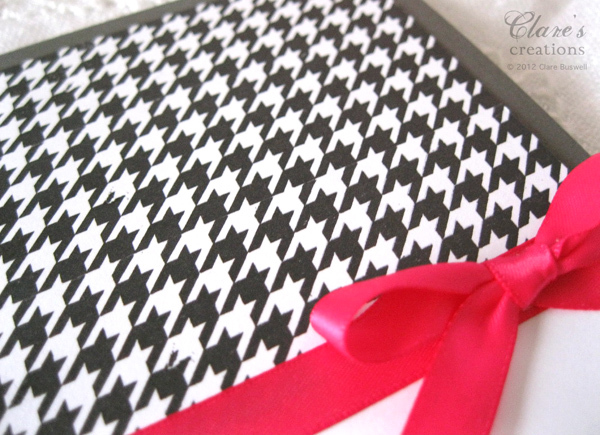 The houndstooth looks wonderful in black with the bright red pop! Wow! Both of these cards are soooo pretty! I love the hounds- tooth and your inspiration piece is so cute! Love how that card came out based on it.....and oh the flower on the second card with those sweet diamonds! Great cards! Oh I missed the sweet baby card this morning! That rosette rocks...since I am so rosette challenged, that die needs to come home and live with me! 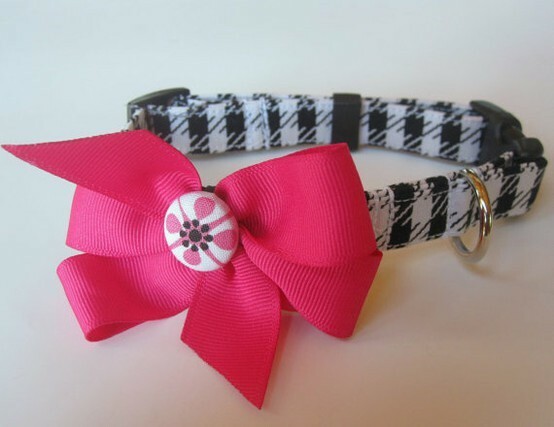 Fabulous CAS design --love the houndstooth in black with touch of pink! And your baby card is so sweet-wonderful details! Gorgeous! I love this beautiful catd! Just delicious! I love how simple and elegant your first card is (love how you were inspired by that fancy dog collar!) and the second is just amazing. The distressed shabby look is just so perfect with the harlequin background and the rosette and felt leaves. You did such an awesome job with these, thank you!